Gilbert was a very hands-on architect, always on the forefront of the construction project. He is the one who insisted on the stunning white Georgia marble used for the upper walls and dome - one of the Capitol's most brilliant features. He called for Minnesota-quarried granite and sandstone for the lower levels, steps, and terraces, and local Kasota stone for much of the interior. 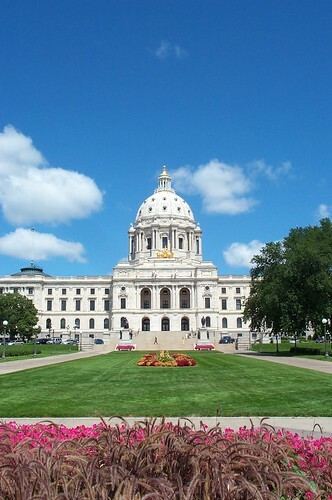 Gilbert's design is dominated by its dome, which echoes that of the U.S. Capitol in Washington, D.C. An inner dome of brick and steel supports the exterior marble of Minnesota's dome, and below that is a painted plaster dome, which is what one sees inside the building looking up from the rotunda. At the base of the dome is the gleaming gold sculpture officially known as the "Progress of the State", but it is usually referred to as the "Quadriga." Designed by Daniel Chester French and Edward C. Potter, the four-horse chariot and figures are made of sheets of gilded copper hammered around a steel frame. Below the Quadriga are six figures that represent "the Virtues" sculpted in white marble (though the the statues in place now are actually replicas carved in 1975-79 to replace the deteriorating originals.) Twelve stone eagles stand guard around the dome, and the exterior is embelished by classical wreaths, plaques, and a rich variety of carvings. 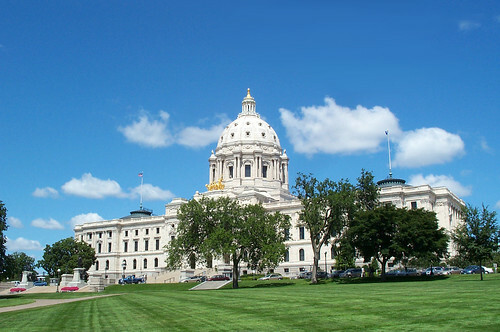 Although antiquarian in spirit, the Capitol was designed to be thoroughly modern. It boasted all-electric lighting, a state-of-the-art heating plant and even telephones. The final bill, including the site, building materials, interior decorations and furnishings, was $4,458,628.27 - about $90 million in today's dollars. The much unloved second Capitol remained in use as a public building until 1937, when it was demolished. History condensed from the Minnesota Historical Society.